Why only explore one of New Zealand’s islands when you could explore both? This exciting 18-night small group escorted tour takes you off the beaten track, helping you to discover all of New Zealand’s hidden gems. 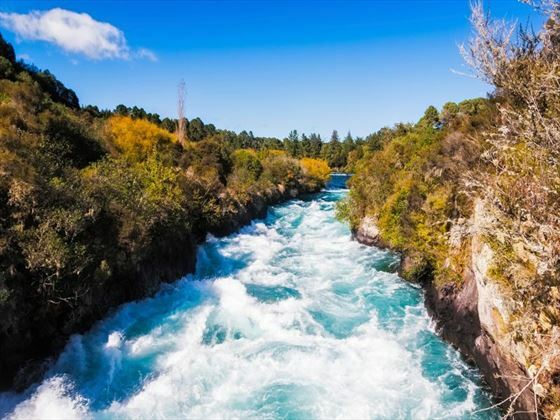 Starting in Auckland and finishing in Christchurch, you’ll venture through some of the North Island’s most natural beautiful landscapes, before embarking on the Interisland ferry to discover everything the South Island has to offer, too. With a maximum of 18 people on each trip, you’ll enjoy a truly personal experience on this escorted tour. 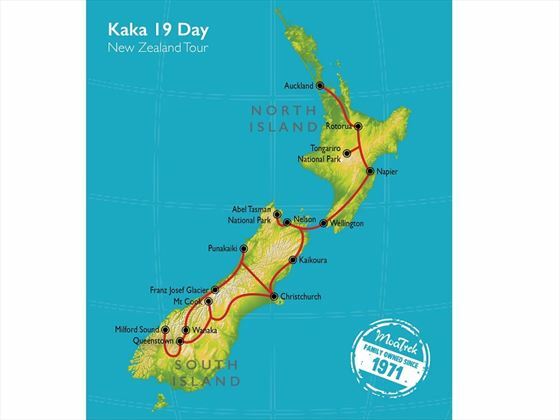 From tasting wines in Marlborough and dining with locals in Lake Tarawera, to visiting the Kiwifruit capital of the world and flying high above the Southern Alps, this tour is full of pinch-yourself moments (MOA). Your tour begins in Auckland, where you’ll be met by a tour guide and be transferred to your hotel for the evening. The rest of the day is then free for you to explore – your hotel is only a short walk away from Viaduct Harbour’s delicious cafes and restaurants, and the bustling downtown shopping district. 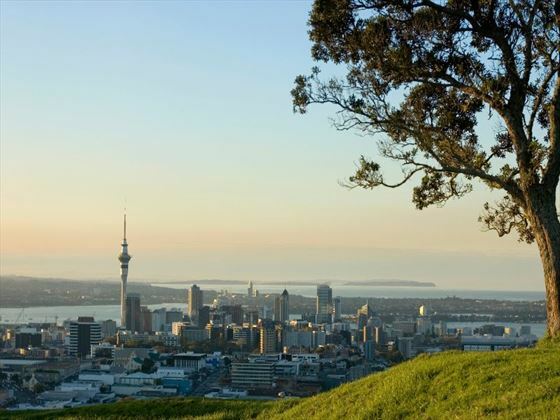 You could even hop on a ferry to Devonport or the Hauraki Gulf Islands to explore, or wander up the Sky Tower for phenomenal views. Today you’ll travel on to Rotorua, passing the luscious Waikato and Bay of Plenty along the way. 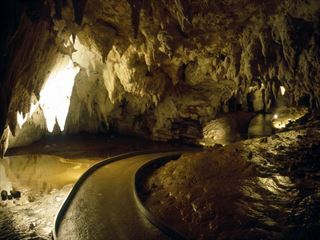 First, you’ll visit the incredible Karangahake Gorge and saunter along the Ohinemuri River to discover the gold-mining relics and ruins, before passing through Te Puke to see the Kiwifruit capital of the world and visit a working Kiwifruit orchard. Afterwards, you’ll continue on to Rotorua - well-known for its geothermal wonders - boarding a 53ft catamaran named Tiua along the way. Whilst on board Tiua, you’ll slowly sail along the tranquil Lake Rotoiti to see the isolated coves and natural hot pools. The morning is free for you to enjoy at leisure. We’d recommend ambling along to the lakeside, and Ohinemutu marae is not to be missed either – it’s one of only two living Maori villages left in New Zealand. After a morning to yourself, you’ll head to the Buried Village of Te Wairoa for a delicious hosted lunch with locals David and Karen, a fascinating couple with plenty of stories from their Maori and European histories. After lunch, you’ll explore the village itself, learning about New Zealand’s national icon – the Kiwi bird – and the conservation efforts made at the Rotorua Kiwi Encounter to ensure their survival. We have no doubt you’ll be surprised by just how big a Kiwi bird can be. Day four will start with a visit to the unique geothermal reserve of Wai-o-Tapu, full of bubbling mud pools and vibrant silica terraces, before heading along to ‘Great Lake’ Taupo to discover the Huka Falls. The afternoon will then be spent slowly strolling along the lake to spot all three volcanoes in the area – Tongariro, Ngauruhoe, and Ruapehu. 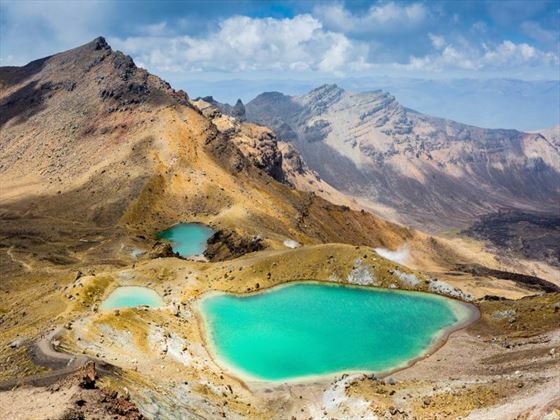 Your evening will be spent at the Tongariro National Park, where you’ll relax in your hotel right by the foot of Mt Ruapehu. Enjoy your breakfast with a view in Chateau Tongariro today, right at the bottom of the mountains. 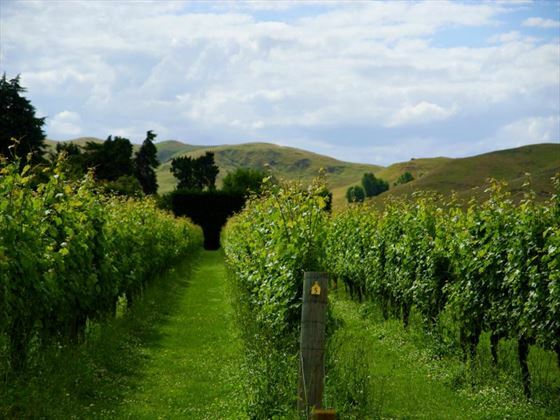 You’ll then travel along the volcanic plateau and across the high country to the beachside retreat of Hawke’s Bay – a very popular spot for locals to holiday. 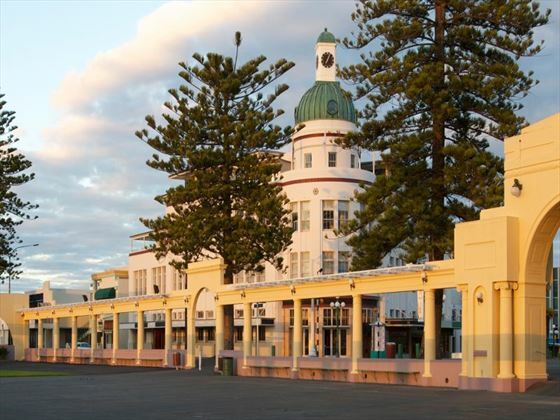 You’ll be sure to feel in the beach holiday mood as you drive pass the region’s beautiful vineyards, orchards and golden coastline, before getting to spend the afternoon exploring Wellington lovingly named the ‘coolest little capital in the world’. The afternoon will be spent climbing up Mt Victoria to take in the spectacular views, before grabbing yourself a craft beer with your dinner and exploring the theatres, galleries and boutiques on offer. Your central location is in walking distance to the waterfront and Te Papa National museum as well as all the eateries and breweries. You'll have a full day at leisure to wander around and enjoy all that this city has to offer. Wellington is also the spiritual home of "The Lord of Rings" where you can visit Weta Workshop and see how all the props are made or drop into the Embassy theatre which hosted the world premier back in 2003. Cruising along from the North Island to the South Island on the Interisland ferry is a trip that will take your breath away. For three hours, you can take in the amazing views of the Cook Strait, Queen Charlotte Sound and Picton before finally setting foot on Te Waka a Maui – the South Island. Once you’ve arrived, you’ll have the opportunity to visit Forrest vineyard for a delectable wine tasting and lunch, right in the heart of the Marlborough sauvignon blanc region. 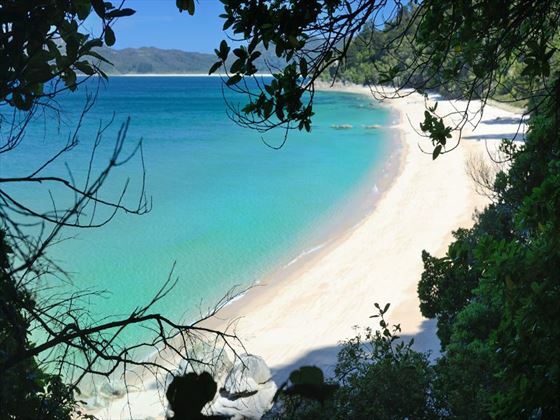 The picture-perfect Abel Tasman National Park is your port of call today. With turquoise waters framed by luscious flora and sugary sand beach, this national park never fails to amaze those who visit. Take your pick from a cruise or a cruise walk combo, giving you the opportunity to hike park of the Abel Tasman Coastal Track and find out how a recent crowd funded initiative increased the area of the park to protect even more of its landscape. This is your opportunity to truly relax and soak up the sun. Laze around on the golden sands, swim in the water with dolphins, and enjoy the blazing sunshine. In the morning, you’ll pass the Pelorus River – the filming location for the barrel run scene in The Hobbit – before travelling along to the Kaikoura Peninsula. The rest of the day is then free for you to explore. 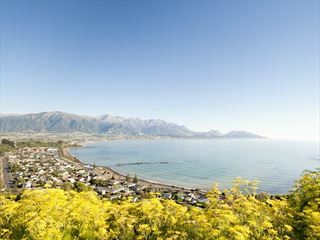 If in the Kaikoura Peninsula, you’ll have the chance to whale watch, swim with dolphins, or visit the seal colony who reside on the edge of town. 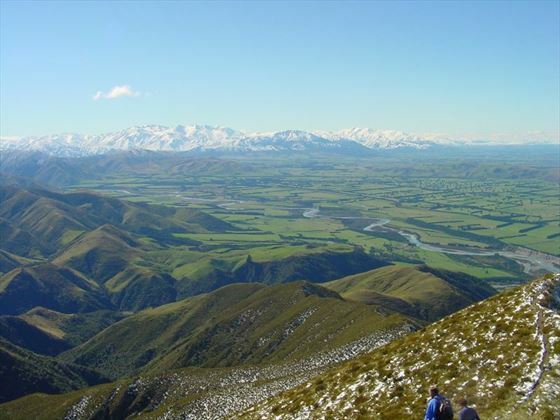 Travelling over the hills to the Canterbury Plains, you’ll catch your first glimpse of the spectacular Southern Alps in the horizon. Lunch is a special affair today, taking place in Akaunui Homestead – a Canterbury heritage building adorned with huge, colourful gardens – with food localled sourced and cooked in the company of Kiwi locals Di and Ian Mackenzie. 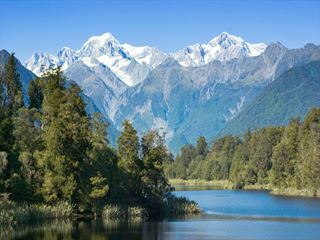 After you’ve tucked in the lunch, you’ll head over the Mackenzie Country, home to wonderful views of the Southern Alps. There’ll be many stops en route, including the unbelievably crystal blue Lake Pukaki and the Church of the Good Shepherd at Lake Tekapo. The morning will be spent exploring the soaring landscapes of Mount Cook, the home ground of Sir Edmund Hillary. You can choose between embarking on an easy walking tour around the village, or hopping on a boat cruise on the glacial lake, a scenic flight, or even a heli hike up on the Tasman Glacier. Then after tucking into lunch you’ll travel along the Lindis Pass and through Kawarau Gorge before arriving in Queenstown, known for its adventurous activities. Take a trip up the Gondola to Bob’s Peak for unforgettable views of the Wakatipu, and then spend the evening taking your pick of Queenstown’s wicked restaurant and bar scene. 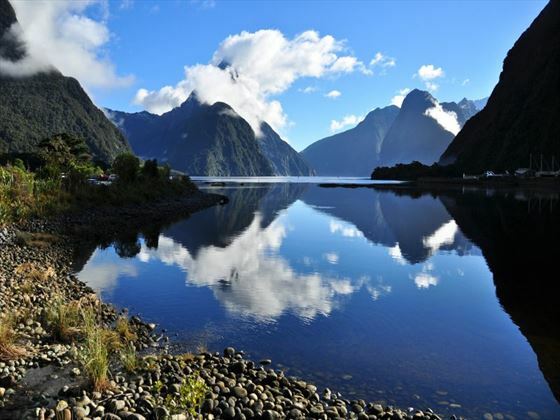 On day 12 you’ll visit Milford Sound, venturing into the heart of Fiordland National Park to marvel at the breath-taking landscapes. Once you’ve arrived you’ll enjoy a cruise out onto the sound, surrounded by Mitre Peak and home to prolific birdlife, large seal colonies, and wonderful pods of dolphins, before taking a flight over the Southern Alps back to Queenstown for the evening. Day 13 will then be free for you to partake in brilliant activities suitable for all ages and abilities. Those who wish to go at a slower pace will enjoy a jet boat ride along the Dart River to take a peek of The Lord of the Rings scenery, or while away an afternoon walking through the Botanic Gardens. An exhilarating raft ride along the Kawarau River is perfect for adrenaline junkies, and we also highly recommend wine tasting in one of Central Otago’s boutique vineyards, or embarking on the 1912 Steamship, the Earnslaw, for a cruise along Lake Wakatipu. Arrowtown’s gold mining history is wildly fascinating, and where better to find out more than beside the foliage-framed Arrow River and in the stimulating museum. 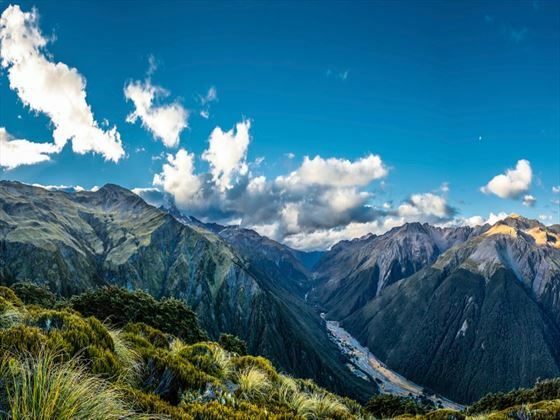 Afterwards you’ll have the chance to climb up the Crown Range for an unbelievable view of the Wakatipu Basin, before visiting Cardrona Hotel for a delve into the colonial era. The rest of the day will then be spent in Wanaka, relaxing with a glass of local wine and dining with locals at their lakeside home. The hotel you’ll be staying at this evening is nestled on the lake edge, close by to wonderful bike and waterfront trails and fabulous kayaking opportunities. Today is jam-packed full of excitement. 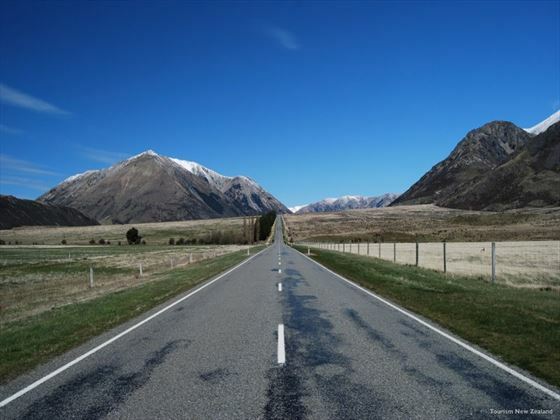 The day begins with a drive along Lakes Wanaka and Hawea, before exploring the sweeping mountains and river scenes of the Mount Aspiring National Park. You’ll then travel over the Haast Pass and discover wonderful beech forests and cascading waterfalls before following the Haast river out to the sea. The whole adventure will be leisurely, so there’ll be ample time for taking photos and drinking in the views. Once that adventure is complete, you’ll then wander through Gondwanaland forest, stopping off at Ship Creek to stroll along the sand and spot dolphins in the shallows. The beach then turns into icy glaciers as you marvel at Lake Matheson’s famous reflections and spot the striking Fox Glacier that descends from Mount Cook. 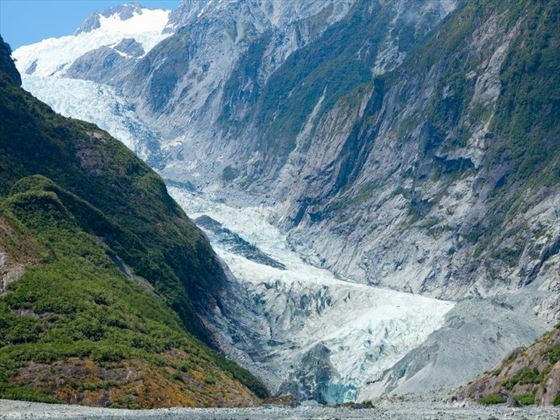 The whole day will be spent discovering New Zealand’s dramatic glaciers, taking a scenic walk to the terminal face of Franz Josef Glacier or enjoying a heli-hike there instead. You’ll also get to discover Okarito, a small settlement perched between the Tasman Sea and Okarito Lagoon, where you can kayak or take a wildlife cruise and spot the extremely rare white heron. Afterwards, how about relaxing in a hot pool fed by pure glacier water? Your morning is free to discover Glacier Country, right in the heart of our West Coast wilderness. Your guide will lead you on a walk up Franz Josef Glacier Valley, to the glacier lookout. You may also take the opportunity to visit West Coast gem of Okarito Lagoon, the home of the rare Kotoku or White Heron. You’ve got a couple of options to discover the lagoon, your choice of kayaking or a nature cruise with a specialist local guide. This afternoon drive through countryside adorned with lakes and rivers and take a coffee stop in Hokitika, the setting for colonial novel The Luminaries. Home to craft-enthusiasts, you’ll even be able to visit the carvers and watch glass blowers, wood and copper artisans. Hokitika is the Pounamu (greenstone) capital, so you won’t want to miss the locals getting crafty. You’ll then saunter through Paparoa National Park and Punakaiki, taking in views of rugged limestone cliffs shrouded with tropical flora, including New Zealand’s only native palm tree, the Nikau Palm. Punakaiki is also home to the Pancake Rocks, and your Kiwi guide will let you know the best time to visit these to see the blowholes are full force. This is a new edition to the trip, a two night stay right on the beach at Punakaiki to end your tour in style. The surrounding Paparoa National Park is very different to any other area we've been, towering limestone cliffs and karst rock formations with beautiful river valleys draped in sub tropical looking forest.You’ll have plenty of time to discover the Pancake Rocks and you can even hike a section of what is soon to be our newest “Great Walk”, the Pike 29 Memorial Track. There are also some great optional activities here, our favourite is the Glowworm Caves a t Charleston, but you’ve also got horse riding or kayaking too if that’s your thing. Your ‘Kiwi Guide’ will let you know the perfect time to visit to see the blowholes at full force. Our home tonight is a stunning spot right on the beach, perfect a drink on the beach to celebrate our last sunset together! Today marks the end of your adventure, enjoy a leisurely breakfast and wander the botanical gardens, take a tram ride, or punt on the Avon River before transferring to the airport for your onwards flight. Please ensure to check the availability with one of our travel consultants as these tours can get booked up fairly quickly due to popularity.